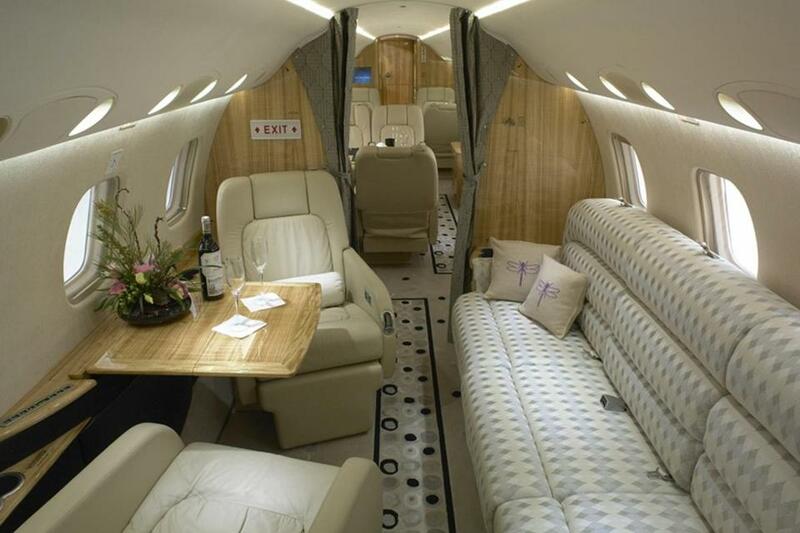 The cabin of an Embraer Legacy 600, one of the planes Alerion Aviation is using to fly clients to and from the Super Bowl. Napkins, jerseys, pom-poms — those items aren’t from a checklist for a Super Bowl party. It’s what some aviation outfits are stocking up on as the big game nears, in addition to fuel and other necessities. Private jet charter services are scrambling to pick up extra business from people who can afford to travel in style to Sunday’s game in Minneapolis between the New England Patriots and Philadelphia Eagles. There are the obvious logistics that have to be sorted out: securing landing and takeoff spots at one of a handful of Minneapolis-area airports that can handle jets, making sure the planes are fueled up, rounding up flight crews. But charter companies also are doing everything they can to cater to high-end sports fans who are dropping tens of thousands of dollars to get a one-of-a-kind experience. “It’s a pretty fun circus,” said Suran Wijayawardan, chief operating officer of Alerion Aviation, which operates flights from both coasts. The Metropolitan Airports Commission, which operates a seven-airport network surrounding the Twin Cities, is expecting about 1,100 aircraft during Super Bowl week, a spokeswoman said. Limited landing and takeoff slots — corporate jet traffic is concentrated on three airports in Minneapolis, St. Paul, and suburban Eden Prairie, all within a half-hour of US Bank Stadium — create a juggling act for private aviation outfits. Almost all of the landing spots, secured through an online reservation system, were gobbled up in the hours following the NFL’s conference championship games on Jan. 21. “Our phones started blowing up” that night, Wijayawardan said. Richard Cawley, chief executive of Bedford-based Rectrix Commercial Aviation Services, said his company’s business picks up around Super Bowl time, especially when the local team is one of the NFL’s final two standing. “We’re very fortunate to be in Patriot nation,” Cawley said. But high-end travelers often turn to private jets for the flexibility they allow, something that becomes an issue when everyone wants to go to the same place at essentially the same time. Aviation companies take care of those travelers in other ways, too. It goes beyond having comfortable seats and a stockpile of craft beers on board. For example, the flight crew might wear the jerseys of the passengers’ favored team, napkins and towels match team colors, and cheerleaders are sometimes on hand to greet passengers as they board. Passengers “want the experience to start the minute they board the jet, as opposed to when they arrive” at their destination, Wijayawardan said. WheelsUp, a private aviation company based on a membership model, hosts a party for its customers during Super Bowl week that features NFL players and other celebrities. And interest is especially high for the game in Minneapolis — WheelsUp says its Super Bowl business is up 60 percent compared with last year’s Patriots-Falcons showdown. But as you might expect, there’s a hefty price to pay for this kind of experience. For example, one Alerion client traveling from a New England airport to Minneapolis is spending about $50,000 to rent an 11-passenger jet. Cawley said Rectrix clients will pay anywhere from $20,000 to $50,000 for the trip. It has about 10 charter flights set for Super Bowl weekend, he said. Based on past experiences, getting clients out of Minneapolis after the game will probably be more complicated than getting them there. With many customers rushing to return to their home bases the next day, the postgame airport scene is always hectic. Jets can sometimes wait on the runway for hours before they get to the front of the takeoff line.